A maintenance (and minor feature-) update for Yoink for Mac is now available on the Mac App Store. What’s new in Yoink v3.5.2? On this website, I collect useful tips to get the most out of Yoink for Mac – I’ve added a couple of new tips to it! Tips are also available for the iOS version of the app here. New on the Mac App Store are bundles. Yoink is part of the “Eternal Storms Software Productivity Bundle”, where you get Yoink, ScreenFloat and Transloader at ~25% off! You can check it out here (macOS Mojave required – though apps purchased with a bundle on macOS Mojave are available on earlier versions of macOS for free re-download). Yoink offers a temporary place for file- and app-content drags to free your mouse so you can more easily and quickly navigate to the actual destination of your drag. This is especially helpful when it comes to moving and copying files between different windows, spaces or (fullscreen-) apps. How does Yoink fit into my workflow? Yoink stays in the background most of the time, waiting for you to drag someting. The app fades in at the edge of your screen when you start a drag, like a file in Finder, or app-content like an image from a website, or text from a document. 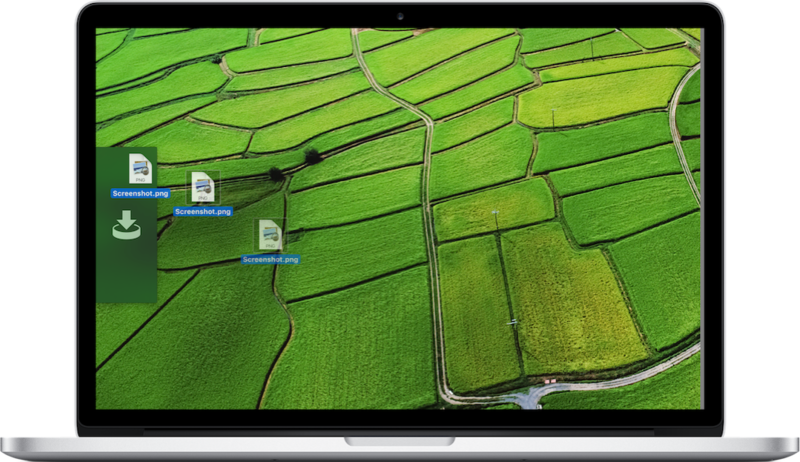 Drag your files to Yoink, and your mouse is free for you to navigate more easily and comfortably. Yoink will hold on to the files you drag to it until you drag them out again. The app can be customized in a number of ways. You can set up where it should appear (at either side of your screen, top, center or bottom; or at the mouse cursor), when it should appear (when a drag starts, or when a drag reaches the edge of your screen) and what apps it should (or should not) appear in. If a file drag contains multiple files, a Stack is created so you can drag them out together again easily. Stacks can also be split up if you’d like to drag out one specific file in that drag. QuickLook is available for all files you add to Yoink, as icon previews for quick identification and as full previews for a detailed look. A keyboard shortcut lets you hide Yoink if you currently don’t need it, and show it again when you do. Yoink for Mac is available on the Mac App Store for the price of $7.99 / £7.99 / €8,99, with a free, 15-day trial available on its website. Yoink is also part of the “Eternal Storms Software Productivity Bundle” – together with ScreenFloat and Transloader at ~25% off on the Mac App Store (macOS Mojave required – though apps purchased with a bundle on macOS Mojave are available on earlier versions of macOS for free re-download). It requires at least macOS Lion 10.7.3, macOS High Sierra 10.13 or newer is recommended. The app is localized in English, German, French, Italian, Chinese (Simplified), Korean, Japanese, Portuguese (Portugal) and Portuguese (Brazil). Yoink is also available for iPad and iPhone, exclusively available on the App Store for the price of $5.99 / £5.99 / €6,99. If you have any feedback or questions, please don’t hesitate to write me! (in Light Mode, it’s obviously better, but still not as subdued as it should be, which is more grey than pitch-black, or whatever color your original icon file might have). The trick is to have the file end in ‘Template’, like ‘MyWorkflowIconTemplate.tiff’. But that’s not all there is to it. 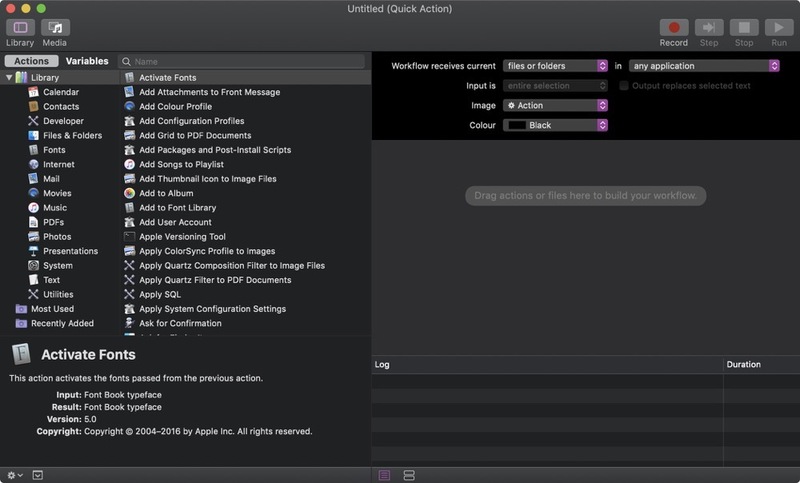 When you add a custom icon through Automator, it automatically gets renamed into ‘workflowCustomImage.png’. So no matter what you name your file, it won’t matter. To fix this, add a custom icon to your Quick Action in Automator, save, switch to Finder and navigate to /Users/yourname/Library/Services/, where your newly saved Quick Action will end up. There, right-click your Quick Action, select ‘Show Package Contents’, and navigate into Resources, where your icon file will be. Rename it to ‘workflowCustomImageTemplate.png’. Now, navigate into Contents and open Info.plist. Look for <key>NSIconName</key> and change ‘workflowCustomImage’ to ‘workflowCustomImageTemplate’. Save. The icon’s a bit too large, even though in Finder and the “More…” menu, it looks well-sized. I thought I’d be smart about it, since the “append ‘Template’ “ trick worked, I’d have three differently sized images and append @2x and @3x. But it didn’t work. The trick is to have a TIFF file with 2 (or 3, to be on the safe side) representations – one at 1x, one at 2x and one at 3x. To create the TIFF, I wrote a small app that takes my icon file, creates three NSBitmapImageRep objects from it and adds them to an NSImage instance. Then it writes the NSImage object’s TIFFRepresentation to disk. Select the first and select Tools -> Adjust Size… in the menu bar. Resize the image to 16×16 (which I found to be working nicely) and set its resolution to 72, if it isn’t already. Select the next thumbnail and resize it to 32×32 at 144 DPI, and the third thumbnail to 48×48 at 216 DPI. Save. Now repeat Tip #1 with this new file and you’re all set. don’t fret, there’s a rather easy fix. In your Today Widget’s Info.plist, in NSExtension > NSExtensionAttributes, there’s NSExtensionPointVersion. I’ve tested back to macOS El Capitan 10.11 and it worked, it will possibly work for earlier versions of macOS, too.